B2B Marketing and Twitter: Strong Marriage, Legitimate ROI? Klurig Analytics was featured in a fantastic article by Dom Nicastro in CMS Wire titled “B2B Marketing and Twitter: Strong Marriage, Legitimate ROI?” The article uses Klurig Analytics’ Twitter analytics monitoring technology as an entry to discuss B2B marketing on Twitter. 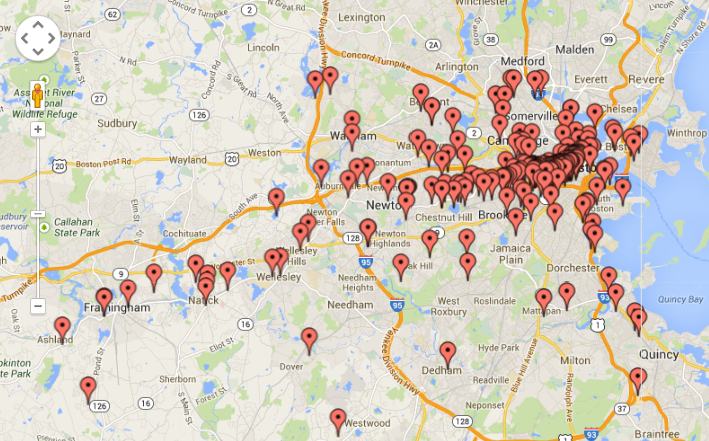 Boston Marathon Tweets from around the marathon course. Here is a link to the Klurig Twitter analytics covering the Boston Marathon, 2014, for additional maps, graphs and analytics, including sentiment analysis. Below is Dom Nicastro’s article. Dag Holmboe trekked along the 26.2-mile running route from Hopkinton, Mass., to Boston for the 2014 Boston Marathon in April. Meanwhile, Holmboe put his Twitter analytics engine to work. Holmboe, CEO and founder of Klurig Analytics in Boston, had a deep interest in the Twitter sentiment around the 118th running of the Boston Marathon. He’s done about a handful of them now, including the 2013 race when two bombs were detonated around the finish line, killing three and wounding close to 300. Not deterred, Holmboe, 55, came back this year again and completed this year’s race, finishing in three hours, 23 minutes and 42 seconds. Meanwhile, his Twitter engine was picking up stats on the #BostonStrong and#BostonMarathon hashtags while analyzing top words, top tweeters and sentiment both positive and negative. Hello There. I found your log using msn. Thhis is a very well written article.